(5 stars) Works as it should! If I am working for a long period of time I place my feet in the under-desk foot rest for instant relief of pain. I never thought of using something like this but this is a must for anyone that works for any extended period of time sat down working. I did not have to make any adjustments out of the box but this could be adjusted for most people. I received this product in exchange for an unbiased review. (5 stars) Break bad posture habits! I owned another unit and was not happy. The Startech unit is great. Easily adjustable keeping my legs level, body straight so that my posture and circulation is much better. I no longer have to sit crossing my legs or resting my feet underneath on the base of the chair. I thought I'd have an issue with my feet sliding off at an angle but the rubberized material really holds on to the soles of my shoes well. I received this product in exchange for an unbiased review. Another great product from StarTech. This product is light, portable to some degree but why it is small enough to move from office to office, desk to desk, it might be a stretch to carry in anything but a large laptop case or rolling case. 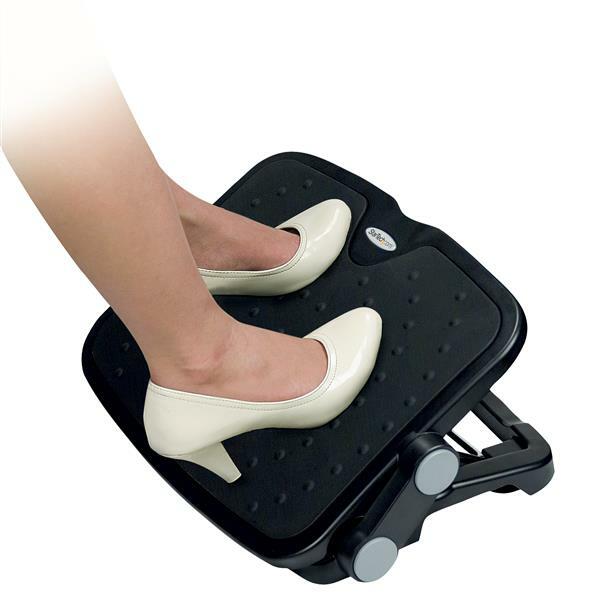 It does the trick to protect basic support to your feet in order to make your work day and back a little less stressed. It is constructed of light plastic with a couple of height adjustments, which should work for most individuals. It comes pre-assembled and comes with a guide to aid you in finding the correct postion and adjustment for your foot rest. Coupled with a great chair and desk, you will have the perfect and comfortable work environment at work and at home. It is after all, all about proper positioning and placement. This works just as well at home as it does at the office, like a kitchen table, etc, etc. It has provided relief to my back and comfort for my feet and legs. At the lowest setting you can "rock" your feet and legs slightly and it does help with tired legs and feet. If you need an assessment / accomodation for work, please be sure to mention this product for your overall assessment / accomodation besides a proper chair, desk and computer stands. It is usually either a company arranged item or your benefits provider is responsibl for any assessment or accomodation for you to do your job effectively. For home, please consult your spouse and ask for one and order one for use at home. It is reasonably priced and comes with the great StarTech 2-year warranty. I received this product in exchange for an unbiased review. I am a person who spends hours in front of the computer and this helps the pain in my legs from sitting so long. 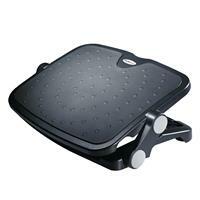 The foot rest offers easy positioning to get the right feel for you. I found the item to have enough weight that it was not sliding all over which was an issue i had with another manufactures unit. If you are looking for a product to help with ergonomics then this is a solid and well built piece that does just what it is intended to do.